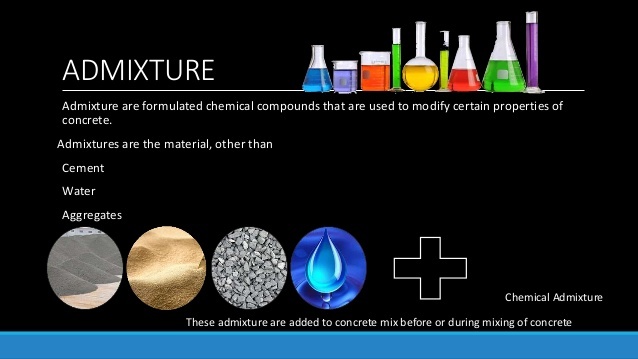 Admixtures of concrete are generally used to alter the properties of concrete (such as increased workability or reduced water content, acceleration or retardation of setting time, acceleration of strength development, and improved resistance to weather and chemical attacks) to make it more suitable for a particular purpose. For example, calcium chloride can be used to accelerate strength development in mass concrete during winter. Air-entraining admixtures (inexpensive soaps, detergents, etc.) entrained air which greatly improves the workability of concrete and thus permits the use of harsher and more poorly graded aggregates and also those of undesirable shapes. Over decades, attempts have been made to obtain concrete with certain desired characteristics such as high compressive strength, high workability, and high performance and durability parameters to meet the requirement of complexity of modern structures. The properties commonly modified are the heat of hydration, accelerate or retard setting time, workability, water reduction, dispersion and air-entrainment, impermeability and durability factors. Chemical admixtures - Accelerators, Retarders, Water-reducing agents, Super plasticizers, Air entraining agents etc. To achieve a higher strength by decreasing the water cement ratio at the same workability as an admixture free mix. To achieve the same workability by decreasing the cement content so as to reduce the heat of hydration in mass concrete. The commonly used admixtures are Ligno-sulphonates and hydrocarbolic acid salts. Plasticizers are usually based on lignosulphonate, which is a natural polymer, derived from wood processing in the paper industry. Surface active agents alter the physic chemical forces at the interface. They are adsorbed on the cement particles, giving them a negative charge which leads to repulsion between the particles. Electrostatic forces are developed causing disintegration and the free water become available for workability. As these agents are organic by nature, thus they lubricate the mix reducing the friction and increasing the workability. Very high later age strengths, >100 MPa or 15000 psi. Reduced shrinkage, especially if combined with reduced cement content. Improved durability by removing water to reduce permeability and diffusion. Give 16–25%+ water reduction. SMF gives little or no retardation, which makes them very effective at low temperatures or where early strength is most critical. However, at higher temperatures, they lose workability relatively quickly. SMF generally give a good finish and are colorless, giving no staining in white concrete. They are therefore often used where appearance is important. Typically give 16–25%+ water reduction. They tend to increase the entrapment of larger, unstable air bubbles. This can improve cohesion but may lead to more surface defects. Retardation is more than with SMF but will still not normally exceed 90 minutes. SNF is a very cost-effective. Typically give 20–35%+ water reduction. They are relatively expensive per liter but are very powerful so a lower dose (or more dilute solution) is normally used. In general the dosage levels are usually higher than with conventional water reducers, and the possible undesirable side effects are reduced because they do not markedly lower the surface tension of the water. Reduce the time for the mix to change from the plastic to the hardened state. Set accelerators have relatively limited use, mainly to produce an early set. Which increase the strength at 24 hours by at least 120% at 20ºC and at 5ºC by at least 130% at 48 hours. Hardening accelerators find use where early stripping of shuttering or very early access to pavements is required. They are often used in combination with a high range water reducer, especially in cold conditions. Calcium chloride is the most effective accelerator and gives both set and hardening characteristics. However, is limited due to acceleration of corrosion of steel reinforcement and decrease resistance of cement paste in a sulfate environment. For this reason, it should not be used in concrete where any steel will be embedded but may be used in plain unreinforced concrete. Chloride-free accelerators are typically based on salts of nitrate, nitrite, formate and thiocyanate. Hardening accelerators are often based on high range water reducers, sometimes blended with one of these salts. Accelerating admixtures have a relatively limited effect and are usually only cost effective in specific cases where very early strength is needed for, say, access reasons. They find most use at low temperatures where concrete strength gain may be very slow so that the relative benefit of the admixture becomes more apparent. In summary, a hardening accelerator may be appropriate for strength gain up to 24 hours at low temperature and up to 12 hours at ambient temperatures. Beyond these times, a high range water reducer alone will usually be more cost-effective. When water is first added to cement there is a rapid initial hydration reaction, after which there is little formation of further hydrates for typically 2–3 hours. The exact time depends mainly on the cement type and the temperature. This is called the dormant period when the concrete is plastic and can be placed. At the end of the dormant period, the hydration rate increases and a lot of calcium silicate hydrate and calcium hydroxide is formed relatively quickly. This corresponds to the setting time of the concrete. Retarding admixtures delay the end of the dormant period and the start of setting and hardening. This is useful when used with plasticizers to give workability retention. 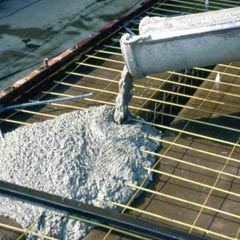 Used on their own, retarders allow later vibration of the concrete to prevent the formation of cold joints between layers of concrete placed with a significant delay between them. The mechanism of set retards is based on absorption. The large admixture anions and molecules are absorbed on the surface of cement particles, which hinders further reactions between cement and water i.e. retards setting. The commonly known retards are Calcium Ligno-sulphonates and Carbohydrates derivatives used in fraction of percent by weight of cement. Resistance to freeze–thaw action in the hardened concrete. Increased cohesion, reducing the tendency to bleed and segregation in the plastic concrete. Compaction of low workability mixes including semi-dry concrete. Cohesion and handling properties in bedding mortars. These additives/admixtures are finer than cement, so when added to concrete they occupy the small pores previously left vacant. These fine particles accelerate the rate of hydration and precipitation starts. Having silica + Alumina oxide+ ferrous oxide more than 70%. Surface area on normal admixture is more than 300m²/kg. Surface area should be more than cement used. Pozzolans are used to improve the workability and quality of concrete, to effect economy, and to protect against disruptive expansion caused by the reaction between different constituents of mass concrete. A pozzolan is defined as a siliceous or siliceous and aluminous material which, in itself, possesses little or no cementitious value but will, in finely divided form and in the presence of moisture, chemically react with calcium hydroxide at ordinary temperatures to form compounds possessing cementitious properties. Natural pozzolanic materials occur in the form of obsidian, pumicite, volcanic ashes, tuffs, clays, shales, and diatomaceous earth. Most of these pozzolans require grinding. Fly ash (fuel dust from power plants burning coal) too can be an excellent pozzolan as it has a low carbon content, a fineness about the same as that of Portland cement, and occurs in the form of very fine glassy spheres. Ground granulated blast-furnace slag is the granular material formed when molten iron blast furnace slag (a by-product of iron and steel making) is rapidly chilled (quenched) by immersion in water. It is a granular product, highly cementitious in nature and, ground to cement fineness, hydrates like Portland cement. (Blast-Furnace Slag: A by-product of steel manufacture which is sometimes used as a substitute for Portland cement. In steel industry when iron ore is molted, then in the molted state all the impurities come at its surface which are removed called slag. It consists mainly of the silicates and aluminosilicates of calcium, which are formed in the blast furnace in molten form simultaneously with the metallic iron. Blast furnace slag is blended with Portland cement clinker to form PORTLAND BLASTFURNACE SLAG CEMENT). GGBFS is used to make durable concrete structures in combination with ordinary Portland cement and/or other pozzolanic materials. GGBFS has been widely used in Europe, and increasingly in the United States and in Asia (particularly in Japan and Singapore) for its superiority in concrete durability, extending the lifespan of buildings from fifty years to a hundred years. Concrete made with GGBFS cement sets more slowly than concrete made with ordinary Portland cement, depending on the amount of GGBFS in the cementitious material, but also continues to gain strength over a longer period in production conditions. This results in lower heat of hydration and lower temperature rises, and makes avoiding cold joints easier, but may also affect construction schedules where quick setting is required. Use of GGBFS significantly reduces the risk of damages caused by alkali-silica reaction (ASR), provides higher resistance to chloride ingress, reducing the risk of reinforcement corrosion, and provides higher resistance to attacks by sulfate and other chemicals. GGBFS is also routinely used to limit the temperature rise in large concrete pours. The more gradual hydration of GGBFS cement generates both lower peak and less total overall heat than Portland cement. In contrast to the stony grey of concrete made with Portland cement, the near-white color of GGBFS cement permits architects to achieve a lighter colour for exposed fair-faced concrete finishes, at no extra cost. Concrete containing GGBFS cement has a higher ultimate strength than concrete made with Portland cement. It has a higher proportion of the strength-enhancing calcium silicate hydrates (CSH) than concrete made with Portland cement only, and a reduced content of free lime, which does not contribute to concrete strength. Concrete made with GGBFS continues to gain strength over time, and has been shown to double its 28 day strength over periods of 10 to 12 years. The finely divided residue resulting from the combustion of ground or powdered coal. Fly ash is generally captured from the chimneys of coal-fired power plants; it has POZZOLANIC properties, and is sometimes blended with cement for this reason. Fly ash includes substantial amounts of silicon dioxide (SiO2) (both amorphous and crystalline) and calcium oxide (CaO). Toxic constituents include arsenic, beryllium, boron, cadmium, chromium, cobalt, lead, manganese, mercury, molybdenum, selenium, strontium, thallium, and vanadium. The burning of harder, older anthracite and bituminous coal typically produces Class F fly ash. This fly ash is pozzolanic in nature, and contains less than 10% lime (CaO). The glassy silica and alumina of Class F fly ash requires a cementing agent, such as Portland cement, quicklime, or hydrated lime, with the presence of water in order to react and produce cementitious compounds. Fly ash produced from the burning of younger lignite or subbituminous coal, in addition to having pozzolanic properties, also has some self-cementing properties. In the presence of water, Class C fly ash will harden and gain strength over time. Class C fly ash generally contains more than 20% lime (CaO). Unlike Class F, self-cementing Class C fly ash does not require an activator. Alkali and sulfate (SO4) contents are generally higher in Class C fly ashes. In addition to economic and ecological benefits, the use of fly ash in concrete improves its workability, reduces segregation, bleeding, heat evolution and permeability, inhibits alkali-aggregate reaction, and enhances sulfate resistance. Even though the use of fly ash in concrete has increased in the last 20 years, less than 20% of the fly ash collected was used in the cement and concrete industries. One of the most important fields of application for fly ash is PCC pavement, where a large quantity of concrete is used and economy is an important factor in concrete pavement construction. The terms condensed silica fume, microsilica, silica fume and volatilized silica are often used to describe the by-products extracted from the exhaust gases of silicon, ferrosilicon and other metal alloy furnaces. However, the terms microsilica and silica fume are used to describe those condensed silica fumes that are of high quality, for use in the cement and concrete industry. Silica fume was first ‘obtained’ in Norway, in 1947, when environmental restraints made the filtering of the exhaust gases from the furnaces compulsory. Silica Fume consists of very fine particles with a surface area ranging from 60,000 to 150,000 ft²/lb or 13,000 to 30,000 m²/kg, with particles approximately 100 times smaller than the average cement particle. Because of its extreme fineness and high silica content, Silica Fume is a highly effective pozzolanic material. Silica Fume is used in concrete to improve its properties. It has been found that Silica Fume improves compressive strength, bond strength, and abrasion resistance; reduces permeability of concrete to chloride ions; and therefore helps in protecting reinforcing steel from corrosion, especially in chloride-rich environments such as coastal regions. This is a bio waste from the husk left from the grains of rice. It is used as a pozzolanic material in cement to increase durability and strength. The silica is absorbed from the ground and gathered in the husk where it makes a structure and is filled with cellulose. When cellulose is burned, only silica is left which is grinded to fine powder which is used as pozzolana.